If you have spent as many hours watching the goodfoodchannel as I have, you will no doubt be able to recognise the unmistakable charm of this historic fishing village. 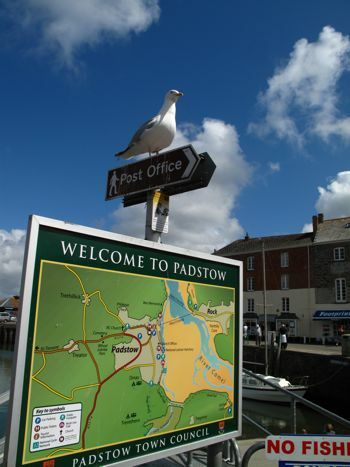 Popularised by one of the old guard of celebrity chefs, Padstow has come to earn the nickname Padstein. And its no wonder. Step off the local bus-stop and immediately, what greets you is an entire enterprise screaming Rick Stein ranging from Cooking school to Deli to Seafood Restaurant to Fish ‘N Chip Shop. 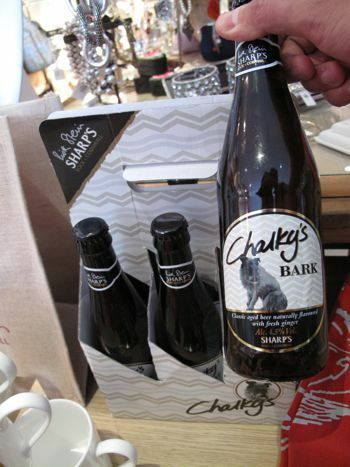 Heck, they’ve even made a series of beers to commemorate Chalky, Stein’s faithful Jack Russell Terrier. Still a little stuffed from our B&B’s full Cornish breakfast courtesy of Kimbra, instead of having a full blown lunch at Stein’s Seafood restaurant, we opted for a lighter bite from his Fish’ N Chips Takeaway. There must have been at least 10 varieties of fish on offer from the more traditional Haddock or Cod, to John Dory and Monkfish even… all battered, fried or grilled as you like. We opted for Hake and Chips, which at £6.95 was very decent value given the whopper of a portion. It was Fish and Chips as it should be. No gimmicks. Just fresh fish, coated in an airy beer-batter, deep-fried in beef dripping to crispy perfection. My only gripe – opening the take-away box and finding out that we had to queue up again to pay an additional 85p for a small tub of tartare sauce (a little petty that it doesn’t come f.o.c if you ask me). Still peckish, we then left Stein-land and went around sniffing out Padstow’s many bakeries to hunt down a good ol’ Cornish Pasty. The best aroma seemed to emanate from the Chough Bakery by the habour-front. It’s hard to miss given there’s a sign outside caling out to all “Pasty Connoiseurs”. 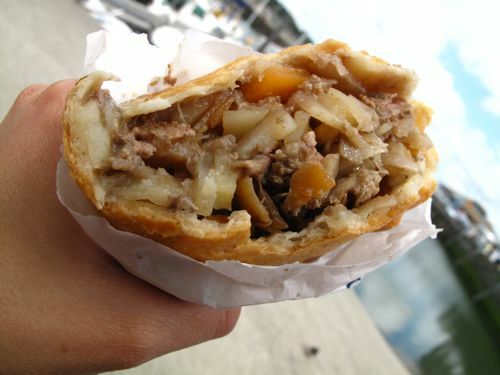 Sadly, it wasn’t anywhere near the best of the Pasties we had this trip. The filling was a little too salty and spuds far too mushy for my liking. One which smelled and looked better than it actually tasted. Locally made Apple Crumble ice-cream on the other hand was an absolute treat. 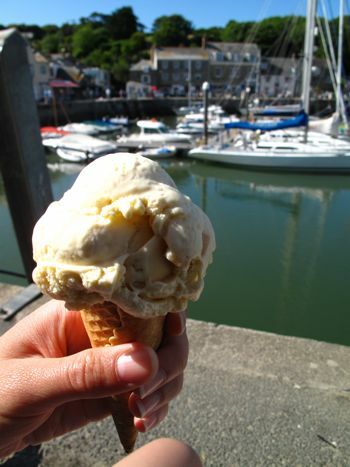 Chunks of sweet, spiced apple, the occasional crunch from the mixed in crumble and of course rich, wholesome Cornish ice-cream. 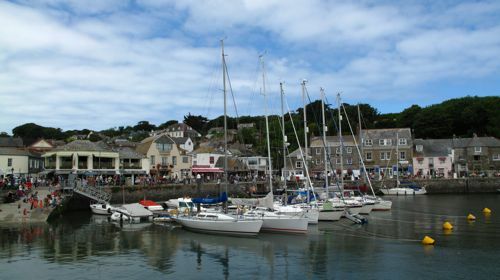 But the best thing about Padstow? – there’s a feeling that time just passes that little bit slower here. 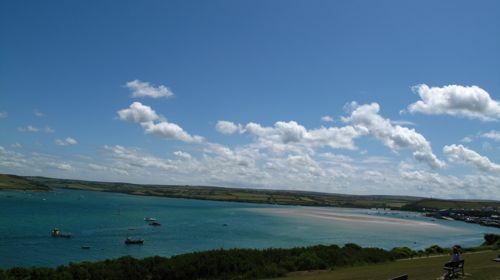 We were there only for a mere 5 hours that afternoon, but as we were boarding the local Greyhound bus to take us back to Newquay, it felt like we had been lazing there for days on end. That fish looks amazing! I admit I always think ‘Rick Stein’ whenever someone mentions Cornwall. 😉 I didn’t realise that they have a range of beers to commemorate Chalky – call me sappy but I think that’s quite sweet. Its quite cute isn’t it: Chalky’s Bite and Chalky’s Bark! I actually only found out fairly recently that poor Chalky had already passed away. Think i see him so much on Stein’s programmes that he still seems very much alive. I detoured 1 hour out of my way just to take my parents to try Rick Stein’s fish and chips. Ate there twice already and still find it amazing. Best fish and chips ever. 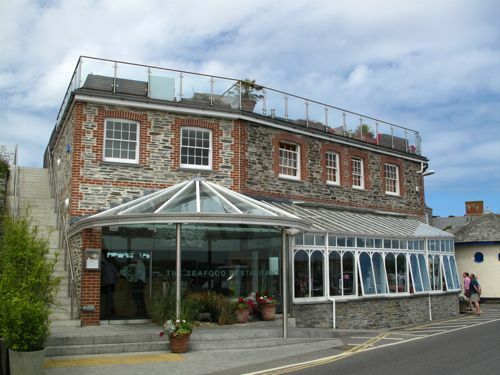 Good to know its consistently good and not just a one off – where else did you visit in Cornwall? Agree – its definitely one of the better Fish and Chips I’ve had as well, but just don’t eat enough of it to be able to tell good from supergood. 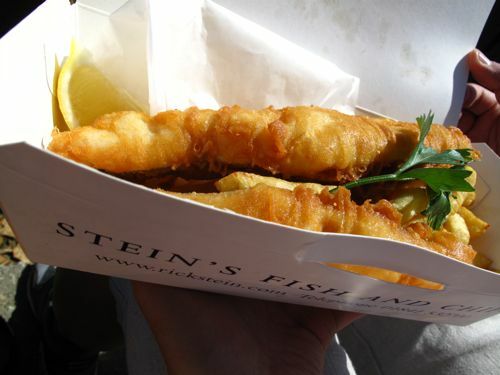 Where’s your fav London Fish and Chip place if any? Canteen in Spitalfields is quite good on its day as is the Golden Hind off Marylebone Lane for me. Mr Fish in Paddington simply because it was near where I used to live! I didn’t fancy much of the others (Harry Ramsden, Rock & Role Plaice) but I didn’t really try a lot of chippies.